The OB chain is utilized for aiding in the delivery of a fetus when assistance is required during birth. The choice of chain length is dictated by where the placement of the fetus is in the birth canal. The shorter length chain is best used when the front legs are exposed and the longer length if the fetus is displaced in the birth canal. 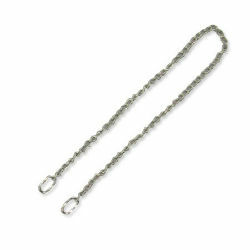 The durable, high strength OB chains come in 30" and 60" lengths. Zinc-plated with an added rust inhibitor.